For the second consecutive year, Grafton just couldn't overcome the juggernaut that is Dover-Sherborn, falling to the Raiders in the D3 title game by a final score of 16-5. It was a game dominated by the Raiders at the face-off X, as D-S junior Joe Paolatto won all but two draws on the day. Grafton junior Brendan Coates scored to make it 2-1 D-S early, but the Raiders went on an 8-0 run, aided by four man-up goals, to push the game out of reach. I'll have full recaps up on ESPN Boston and BostonLax soon, but here are a few wandering thoughts. It was a rough day all around, but senior Hunter Fraser really found his shooting groove to close his high school career in style. The low-shooting marksman scored three goals, all from the outside, and each a beauty. The Indians struggled to penetrate the Raiders' defense all day, but Fraser's work from the outside was one thing they could count on. The Indians were their own worst enemy in the first half. Trailing only 2-1 in the first quarter, Grafton was flagged for four different penalties, and D-S capitalized on each of them. It's hard enough to beat a team as good as the Raiders, but to do it man-down… That's nearly impossible. A few of the calls were iffy, especially a hold called on Nick Hart when it looked like the D-S attackman tripped while making a cut, but you still can't put yourself in those positions. While it wasn't the ending they wanted, Grafton's seniors will still go out as one of the best classes in program history. 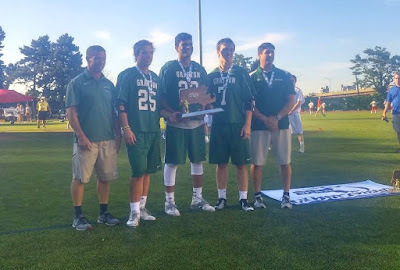 This group won a combined 69 games in its four years on campus, capturing four Mid-Mass crowns, a pair of Division 3 Central/West titles, and earning two trips to the state championships. Those district titles and state finals appearances are the first in school history, and the 69 wins make this one of the winningest classes Grafton has even seen (the 2013 class walked away with 80 wins, however, and the 2014 class finished with 75). Still, you'd be hard-pressed to find a class that played more for each other. "The thing I'll always remember about playing here, was just the family," senior Chase Kapuscienski said. "We all love each other, and we've all got each other's backs. Even when we were getting blown out in the state finals two years in a row, these guys never stopped playing for each other." While there's no doubt Grafton will lose a ton to graduation, don't expect this team to fall off a cliff. With rising seniors Tom Nicalek, Danny Bartosiewicz and Jack Fontana back on defense, alongside LSM Ifeatu Melifonwu, the Indians should again boast one of the best defenses in Central Mass, even with the loss of LSM Nick Hart. In net, senior Cadrin Msumba leaves some big shoes to fill, but expect rising junior Matt Nicalek to step in and be ready to play from day one. In the midfield, Grafton will no doubt miss Chase Kapuscienski, Matt O'Brien, Josh Birdsall and Mike Najemy, but they'll have plenty of talent coming back. Rising seniors Anthony D'Angelo, Ryan Tyldesley should carry heavier loads next season, while rising juniors Jimmy Donadio and Connor Driscoll each showed promise this season. Up front is where the Indians will have to replace the most, as Fraser and Cole Fontana move on, but Brendan Coates will be back for his senior season after a great second half of this year. They'll need someone else to step up on attack, but even if they can't produce the way this year's unit did, Grafton should again contend on the back of its defense and midfield.